For other uses of Arcadia, see Arcadia (disambiguation). Arcadia (Greek: Αρκάδια) refers to a vision of pastoralism and harmony with nature. The term is derived from the Greek province of the same name which dates to antiquity; the province's mountainous topography and sparse population of pastoralists later caused the word Arcadia to develop into a poetic byword for an idyllic vision of unspoiled wilderness. Arcadia is a poetic shaped space associated with bountiful natural splendor and harmony. The 'Garden' is often inhabited by shepherds. The concept also figures in Renaissance mythology. Although commonly thought of as being in line with Utopian ideals, Arcadia differs from that tradition in that it is more often specifically regarded as unattainable. Furthermore, it is seen as a lost, Edenic form of life, contrasting to the progressive nature of Utopian desires. The inhabitants were often regarded as having continued to live after the manner of the Golden Age, without the pride and avarice that corrupted other regions. It is also sometimes referred to in English poetry as Arcady. The inhabitants of this region bear an obvious connection to the figure of the noble savage, both being regarded as living close to nature, uncorrupted by civilization, and virtuous. According to Greek mythology, Arcadia of Peloponnesus was the domain of Pan, a virgin wilderness home to the god of the forest and his court of dryads, nymphs and other spirits of nature. It was one version of paradise, though only in the sense of being the abode of supernatural entities, not an afterlife for deceased mortals. Greek mythology inspired the Roman poet Virgil to write his Eclogues, a series of poems set in Arcadia. Arcadia has remained a popular artistic subject since antiquity, both in visual arts and literature. 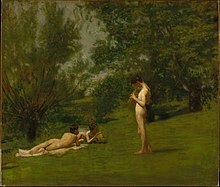 Images of beautiful nymphs frolicking in lush forests have been a frequent source of inspiration for painters and sculptors. 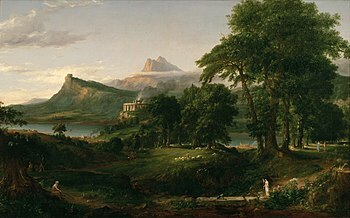 As a result of the influence of Virgil in medieval European literature (see, for example, Divine Comedy), Arcadia became a symbol of pastoral simplicity. European Renaissance writers (for instance, the Spanish poet Garcilaso de la Vega) often revisited the theme, and the name came to apply to any idyllic location or paradise. Unlike the word "utopia" (named for Thomas More's book, Utopia), "Arcadia" does not carry the connotation of a human civilization; Arcadia is presented as the spontaneous result of life lived naturally, uncorrupted by civilization. Of particular note is Et in Arcadia ego by Nicholas Poussin, which has become famous both in its own right and because of its (possible) connection with the gnostic histories of the Rosicrucians. In 1502 Jacopo Sannazaro published his long poem Arcadia that fixed the Early Modern perception of Arcadia as a lost world of idyllic bliss, remembered in regretful dirges. In the 1580s Sir Philip Sidney circulated copies of his influential heroic romance poem The Countess of Pembroke's Arcadia establishing Arcadia as an icon of the Renaissance; although the story is plentifully supplied with shepherds and other pastoral figures, the central characters of the plot are all royalty visiting the countryside. The Spanish playwright and poet Lope de Vega also published in 1598 his Arcadia: Prose and Verse, which was a bestseller for its time. Does not the pleasantness of this place carry in itself sufficient reward for any time lost in it, or for any such danger that might ensue? Do you not see how everything conspires together to make this place a heavenly dwelling? Do you not see the grass, how in color they excel the emeralds ...? Do not these stately trees seem to maintain their flourishing old age, with the only happiness of their seat being clothed with a continual spring, because no beauty here should ever fade? Doth not the air breathe health which the birds (both delightful both to the ear and eye) do daily solemnize with the sweet consent of their voices? Is not every echo here a perfect music? And these fresh and delightful brooks, how slowly they slide away, as, loath to leave the company of so many things united in perfection, and with how sweet a murmur they lament their forced departure. Certainly, certainly, cousin, it must needs be, that some goddess this desert belongs unto, who is the soul of this soil, for neither is any less than a goddess worthy to be shrined in such a heap of pleasures, nor any less than a goddess could have made it so perfect a model of the heavenly dwellings. Though depicted as contemporary, this pastoral form is often connected with the Golden Age. It may be suggested that its inhabitants have merely continued to live as people did in the Golden Age, and all other nations have less pleasant lives because they have allowed themselves to depart from the original simplicity. Arcadia is now the name of many cities and towns around the world, including upwards of a dozen municipalities in the US. Arcadia University is a college located in Glenside, Pennsylvania. The plotlands of Wales and England have been referred to by media and local Government as Arcadia. The 16th-century Italian explorer Giovanni da Verrazzano applied the name "Arcadia" to the entire North American Atlantic coast north of Virginia. In time, this mutated to Acadia. The Dictionary of Canadian Biography says: "Arcadia, the name Verrazzano gave to Maryland or Virginia 'on account of the beauty of the trees', made its first cartographical appearance in the 1548 Gastaldo map and is the only name on that map to survive in Canadian usage. . . . In the 17th century Champlain fixed its present orthography, with the 'r' omitted, and Ganong has shown its gradual progress northwards, in a succession of maps, to its resting place in the Atlantic Provinces". Revival of Mi'kmaw language has provided strong reason to believe that Verrazzano was informed by the name the Mi'kmaq gave to this place. The name Acadie may be derived from the Mi'kmaq, because in their language the word “cadie” means "place of abundance” and can be found in names such as “Tracadie” and “Shubenacadie”. Arcadia has been a popular setting for writers of the 19th and 20th centuries, including W. S. Gilbert (in Happy Arcadia and Iolanthe). One of the most popular Edwardian musical comedies is The Arcadians. In 1945, Evelyn Waugh sub-titled the first part of his novel Brideshead Revisited "Et in Arcadia ego". In Gabriel García Márquez's novel One Hundred Years of Solitude, the founder and patriarch of the Macondo community bears the name José Arcadio Buendía. Over the course of the novel, Arcadio becomes a multigenerational patronym that resonates with many of the other utopian tropes explored elsewhere in the text. In the novel Blood Meridian by Cormac McCarthy, the character of Judge Holden names his rifle "Et in Arcadia ego". In 1993, Tom Stoppard wrote Arcadia (originally to have been titled Et in Arcadia ego), a play involving themes of classical beauty and order in nature. Arcadia were a spin-off musical group formed in 1985 by three members of the band Duran Duran. Rock band The Libertines have referenced Arcadia as the destination their imaginary ship Albion sails towards. Canadian music producer Deadmau5 has a song called Arcadia. The Kite String Tangle also have a song titled Arcadia. The metal opera Angel of Babylon by Tobias Sammet's Avantasia ends with "Journey to Arcadia". In fantasy literature, Arcadia has been used as a magical realm, respective to the fictional universe in which the story occurs. Arcadia Darell is the name of a character in Second Foundation by Isaac Asimov. In the anime series Captain Harlock, the ship in which he travels is known as the Arcadia. He calls it the place "to fight and live for our freedom [and dreams]". In the recent movie Resident Evil: Extinction, the characters seek to travel to Arcadia, Alaska, which is promised to be free of zombies. In Resident Evil: Afterlife 3D, it is revealed that Arcadia refers to the USS Arcadia, a ship that collects survivors for experimentation. Arcadia (2016) is the title of a novel by Iain Pears. A number of role-playing games have also adopted the idea, either using it as a separate realm within the multiverse (à la the Arcadia of the Dungeons & Dragons universe), or even using it as the central focus of an entire game system (as in White Wolf's Changeling: The Dreaming game). In Changeling: The Lost, Arcadia is presented as a hellish realm, where humans abducted by the True Fae are subject to unimaginable torment and torture, in sharp contrast to its usual utopian description. Dragonhaven, a young adult fantasy novel by Robin McKinley, ends with the phrase "Arcadiae vias peregrinentur," which the author has stated roughly translates to "May they walk in Arcadia". According to the best-selling PC-game The Longest Journey, Arcadia was divided from the primordial original world, and represents fantasy, dreams and magic, while our world, Stark, is the world of science and technology. In the game BioShock, Arcadia is a level in which the protagonist has to navigate through an artificial forest. Arcadia was created by Dr. Julie Langford. This forest provides the oxygen for the rest of the underwater city of Rapture, and was used as a peaceful retreat for the citizens. Arcadia is the name of the world in the Sega Dreamcast game Skies of Arcadia in which the inhabitants live on floating islands and continents, and fly through the skies in airships. "Neo Arcadia" is the name given to the now center-of-the-world paradise city in the post-apocalyptic world of the Mega Man Zero series, as a place where humans and reploids live together side by side, though the Neo Arcadian government proves to be overbearing & ruthless in the fight against mavericks, going so far as to unjustly condemn innocent reploids to retirement(i.e. death). As such, they are the main antagonistic force throughout the majority of the "Zero" series. In "The Longest Journey" and "Dreamfall" PC games, Arcadia is a realm of magic which the player is transported to. The name has recently been connected with the pseudo-history of the Freemasons - in particular the Latin motto "Et in Arcadia ego" ("Even here, I [Death] exist.") The phrase is used frequently in conspiracy fiction and lore, such as the pseudo-historical work Holy Blood, Holy Grail and the novel The Da Vinci Code, where it is interpreted as an anagram of I! Tego Arcana Dei ("Begone! I know the secrets of God"). Arcadia is also the name given to the second-city of the Time Lord's home-planet Gallifrey in the British sci-fi TV series Doctor Who. The Gods of Arcadia is a sci-mythology series by Andrea Stehle. It is a world in mankind's future controlled by the gods of ancient Greece. ^ Puech, Pierre-François. "Dead Poets in the bay of Rosas (Spain) –la Gargouille de la Platja de Canyelles Petites". academia.edu. Retrieved 23 March 2018. ^ "What is the meaning of the word "Acadie"? » Acadian Museum of Prince Edward Island". museeacadien.org. Retrieved 23 March 2018. Green, Stanley. "The Arcadians". Guide to Musical Theatre. New York: Da Capo Press. ISBN 0306801132.